In continuation to my previous post "Segment Routing: Alternate of LDP and RSVP", I would like to bring some testing results which really help me to understand better the behavior of segment routing control plane without using LDP and RSVP. In the testing environment, every router is allocated one node segment per PE. This is the simplest one and works as per your IGP metric. 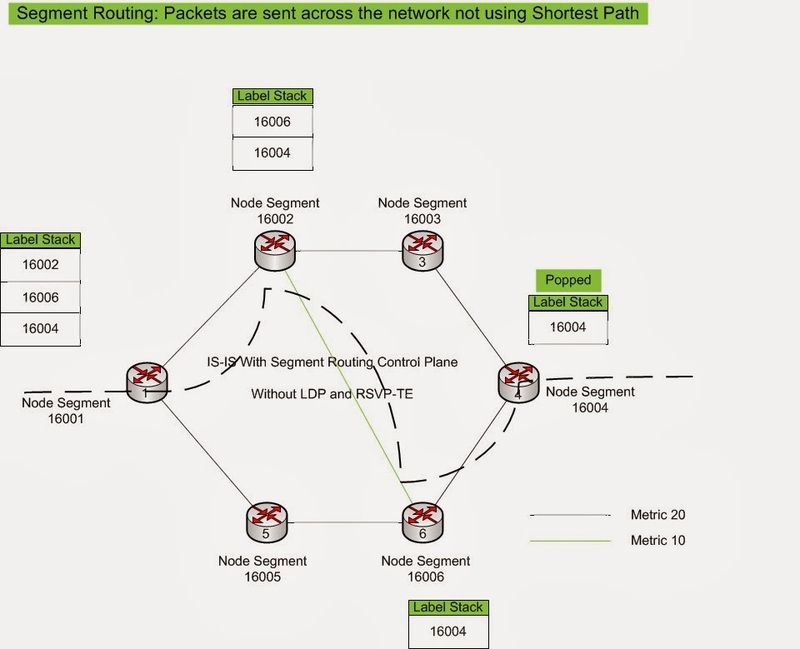 How does it differ from standard MPLS? The only difference is that segment routing doesn't require any LDP to build its control plane. In MPLS labels are generated for each and every prefix in IGP or only for loopbacks. 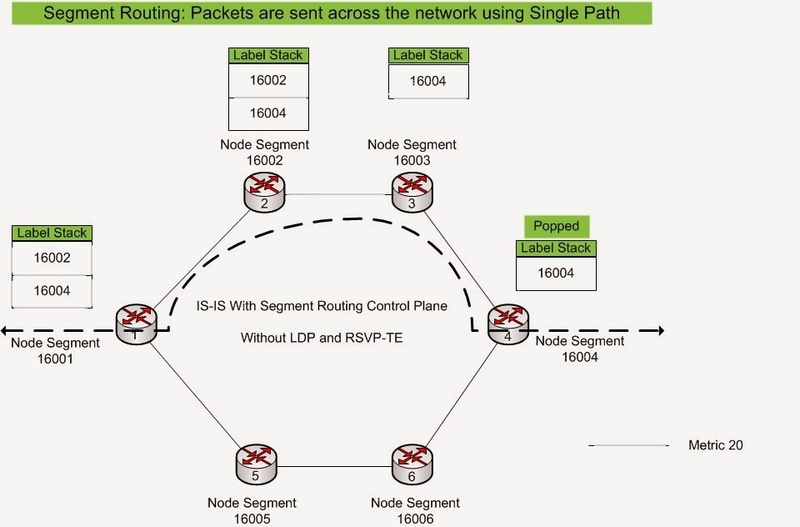 In segment routing, per PE is having single label which is called node segment. 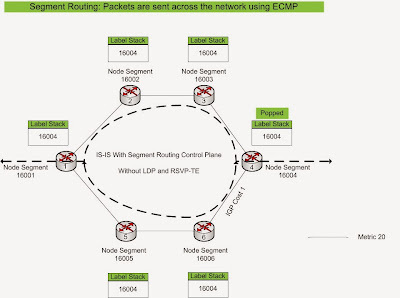 If destination has two ECMP paths, packets are always sent to both the paths. But this can be changed by tweaking the IGP metric and forcefully we can utilize single path instead of two. By using segment routing we are imposing two labels of different segment nodes and lookup is done according to that. 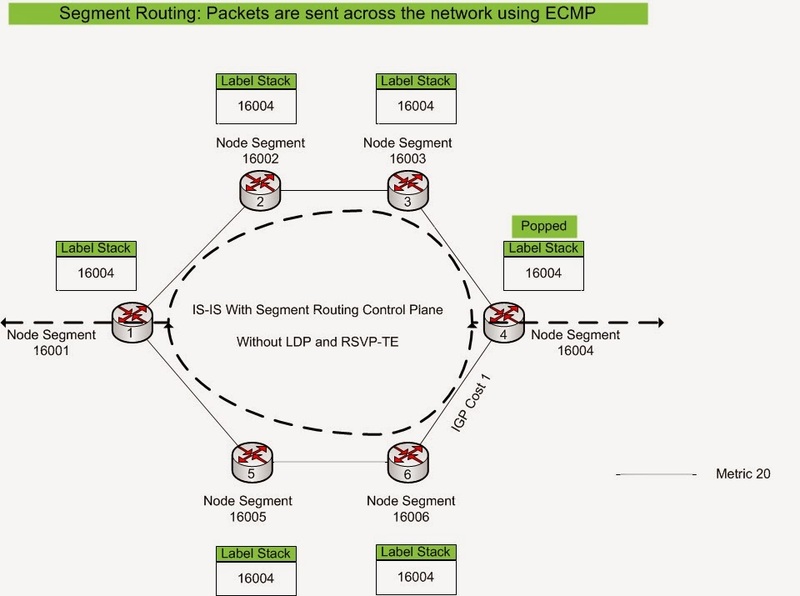 By doing this we are only using a single path even though we have two ECMP paths are available. How does it differ from standard MPLS and RSVP-TE? If the same has to be done in MPLS, we need to enable RSVP-TE to play around it. RSVP-TE with LDP requires lot of planning in terms of bandwidth reservation and adding more complexity in terms of operations. But in SR, you don't require anything to get this done. 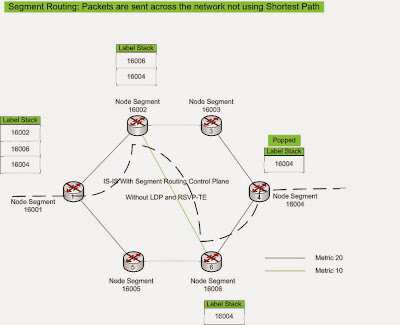 Labels has been imposed according to the path required to forward the packets. To get this done, we require LDP and RSVP-TE. We need to create the TE tunnels. Explicitly define the tunnel path. By doing this we are only adding the complications for the operation team. In segment routing, the all we are adding only node segment IDs in the label stack. do you have any configuration example demostrating variuos use cases of segment routing ? if you can share that would be great.